The city of Miami in Florida is the busiest cruise port in the world. It’s the gateway to the Florida Keys, for cruises to the Caribbean and South America. With its subtropical climate, year-round sunshine, spirited Cuban population and latin flavor, Miami attracts millions of tourists from all over the world every year. Stay in a pre or post cruise discount or more luxurious hotel close to the port and shopping, in downtown, at the beaches of South Beach and Miami Beach or right next to MIA international airport. Several hotels near the airport provide a complimentary transport shuttle service, parking and free breakfast. Best Deals close to Terminals, Where to Stay ? If you’re on a budget, consider a stay near MIA airport and Blue Lagoon area. Lots of good quality, reasonable priced, and budget friendly properties are located in this area. Shopping and dining options are within walking distance. At the airport you can catch also the cheap Airport Flyer bus to Miami Beach, for a relaxing day at the beach. Book one of our cheap deals and save money for your next cruise. Many hotels near the airport provide a free shuttle service transport to/from the airport. Some will take you to the port as well. No downtown or Miami Beach hotels offer MIA airport shuttles. If you stay downtown, which is very close to the port, you can take a quick cab to one of the terminals. If you are travelling with kids or desiring the beach, head for South Beach (SoBe), Miami Beach or North Miami Beach. You should be able to find several family friendly resorts hotels there for every budget. Downtown Miami fl. hotel within close distance of the cruise terminals. View of Port, 15 minutes drive from the airport. Highly rated downtown hotel not far from the Port of Miami in Florida. Reasonable priced 3 star hotel located near Miami International Airport MIA (free shuttle). Relaxing on the deck, exploring different lands and cities, enjoying the dazzling entertainment and being wined and dined… there are many reasons to choose a cruise for your holiday. Whatever you want to get from your cruise, you’ll want to be sure that you’re at the Port of Miami ready to get to the cruise terminal on time. That’s why we offer amazing deals on hotels near the cruise terminal. Not only in Miami, but near all Florida cruise ports they are some great savings available. Check cheap deals near the Port of Tampa, Port Canaveral Hotels, Ft Lauderdale Hotels with Free Port Shuttle and Jacksonville Cruise port hotels as well. PortMiami — the seaport is recognized as the “Cruise Capital of the World” and “Cargo Gateway of the Americas”. Many large cruise companies have their headquarters in Miami. It’s the the largest container port in the state of Florida. The Port of Miami is located in Biscayne Bay, 5 minutes from downtown and 4 miles from Miami Beach, and can accommodate the world’s largest cruise ships. Miami is the world’s cruise capital since the later half of the century when cruise vacations became more popular. Today, more than 4 million cruise passengers per year depart from one of the cruise ship terminals, making it the busiest cruise port in the world. All major cruise lines operate from the port such as Carnival, Royal Caribbean RCL, Celebrity Cruises and Norwegian NCL. Located on Dodge Island, the port currently consists out of 8 cruise passenger terminals, located alongside the Fisherman’s Channel (South) or Main Ship Channel (North). Taxis and shuttle buses are available at all terminals. For a flat fee, taxi services provide transportation between the International Airport and the passenger terminals (CT). These are B, C, D, E, F, G, H and J.
Terminals D and E are both ultramodern complexes which can accommodate the largest mega-ships. Terminal J is a smaller terminal used for disembarkation or embarkation by more luxury liners such as Oceania Cruises, Crystal Cruises and Azamara Cruise Lines, as well as Regent Seven Seas. Many hotels also offer shuttle buses, accessible parking and/or taxi options to get to the cruise terminal. Many properties will provide you with expert advice on how to organize the practicalities. Take a look out our range of hotels and motels in the Miami area. We’re sure that you’ll find an amazing deal to suit your tastes and budgets to start your cruise holiday. Miami is famous for its stunning beaches, prime Florida locations and gorgeous streets lined with palm trees. It’s a stunning, sunny, and friendly place, and so one of the best places to start a fantastic cruise holiday. The port and the cruise terminal are both situated just off the coast, right near Miami Beach, giving you available access to beach life from your cruise port hotel. 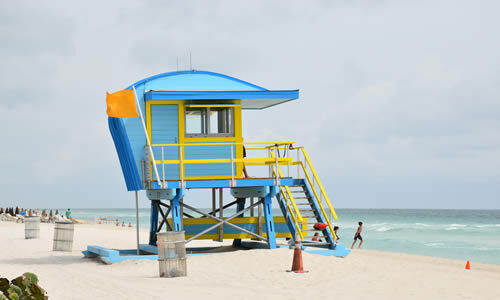 Miami Beach boasts long stretches of golden, sandy coastline. You’ll recognize the striking, famous Miami landscape of awe-inspiring skyscrapers set against almost permanent blue skies. The coastline also offers a wide array of bars, clubs, and restaurants to enjoy. This really is the perfect place to start a cruise, whether you’re a local or live further out, whether you’re just stopping off for the night, or spending a few days to enjoy Miami at the beginning or end of your cruise. 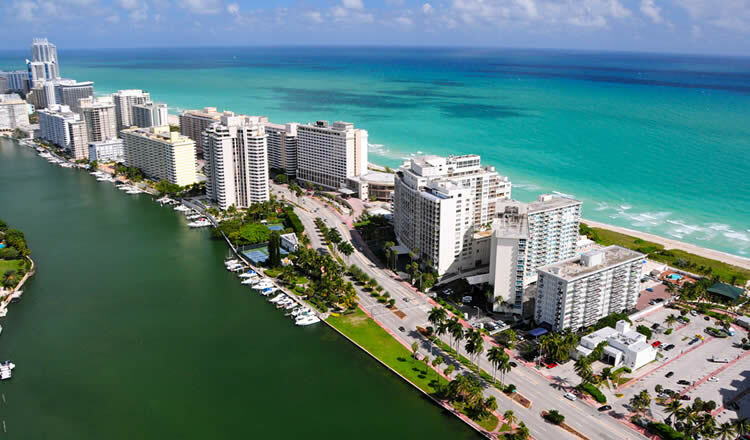 So you’ll want to be sure that you find the best, cheapest hotels near the Port of Miami. We’ve hand selected the best deals on hotels, giving you easy access to the cruise port terminal, and just a hop away from the main attractions. When thinking about the beginning and the end of a holiday, we often think about travelling long distances in a car or on a train, getting all the documents together, rushing to an airport or dock to catch a flight, and hurriedly lugging baggage around. Don’t start your cruise holiday on a stressful note! Find the best deals on hotels near the Port of Miami, close to the cruise terminal to be sure that the start of your holiday is a breeze. Save time, money and stress by finding a hotel just at the right location to catch your cruise. Maybe you want to be absolutely sure that your holiday starts off on a relaxed note, and choose to spend a lovely few days exploring Miami. Perhaps you just want to be sure that you don’t have to travel too far early in the morning on the day of your cruise. However you choose to plan the start of your cruise, we will have a wide range of cheap hotels at ideal locations, all in the vicinity of the Miami Port Cruise Terminal. We understand that you don’t want to drive up the total cost of your holiday by booking premium priced hotels near the port cruise terminal. This is why we have collected the best deals on hotels, which are ideally placed to travel to the port terminal. You’ll be able to choose the right hotel for you, making sure that you start your hotel on the right tone, without breaking the bank. Are you going on a cruise with your family? You’ll want to make sure that your hotel is family friendly, with all the amenities you need to have a comfortable start to your family holiday. Many of our best deals on hotels offer practicality and comfort, perfect for your family. You don’t have to compromise on cost; many of our best deals are the perfect fit for families of all shapes and sizes. Finding great deals on cheap hotels in Miami Port near the Cruise Terminal doesn’t mean that you have to compromise on style, sophistication or comfort. We have a wide range of deals on hotels to suit many tastes and budgets. You’ll know that whatever you choose, you’ll get the best deal on your hotel near the cruise terminal. Take a look at our amazing deals on a range of hotels in the area, perfect to suit your needs. Just browse our website to find the right hotel for you at the absolute best price. You’re sure to be amazed and have a wonderful start and end to your cruise. The city’s primary airport is called Miami International Airport, located approximately 7 miles from PortMiami. The airport is well served by taxis, as well as several shuttle bus services available 24 hours a day. An affordable way to get to downtown and Miami Beach is by The Airport Flyer express bus, providing convenient transportation from the Miami Intermodal Center (MIC). Many passengers fly into Fort Lauderdale International Airport, approximately 45 minutes or 25 miles away from POM and located close to Port Everglades cruise terminals. Parking is available at the Port of Miami, also for over-lenght vehicles and trailers. Reservations are not required. Complimentary shuttle service from each parking facility to each terminal door is offered to all cruise passengers. Daily long-term and short-term rates apply. 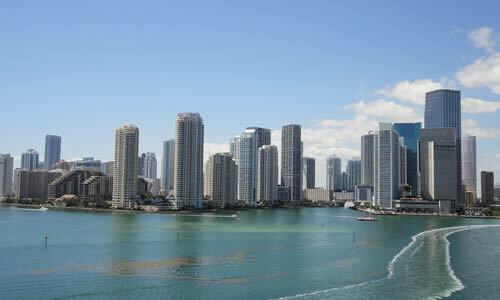 Take a tour of Miami and discover the rich history of the city and admire the pastel skyscrapers. Visit Little Havana for a taste of Cuban culture and cuisine on Calle Ocho. Experience the Mediterranean style of Coral Gables or admire the beautifully classic Biltmore Hotel, since 1926 host to presidents, royalty and great stars. Take a look at the Vizcaya Museum and Gardens, the former villa and estate of businessman James Deering. The Miami Beach area boasts gorgeous white sandy beaches giving onto the azure blue of the Atlantic Ocean. Enjoy an evening stroll along the boardwalk facing the turquoise sea, or hire a bike or segway and take a ride along the promenade lined with tall palm trees. Many hotels in Miami Beach feature an outdoor swimming pool, and are within easy walking distance of the beach. Many lodging facilities also offer complimentary Wireless Internet Access, some offer a free Continental Breakfast Buffet. A must see is the Art Deco Historic District in South Beach (SoBe), with over 800 pastel-coloured Art Deco buildings, built in the 1920’s and 30’s. Lining the beach is famous Ocean Drive, a popular spot for dining and known for its vibrant club scene. Some of Miami’s finest and brightly lit hotels are located on the strip, or close by right on the beachfront. South Beach is considered to be the southernmost 2 miles of Miami Beach. It’s home to the beautiful Art Deco districc, designer boutiques, and the best nightlife. Stay in this area and all the action is within walking distance. Extend your cruise vacation with a couple days relaxing on the beach, or visit the subtropical Everglades wetlands area, an important natural habitat for alligators and other marshland wildlife. A fun day out for the entire family is the Miami Seaquarium, home to fish, sharks, orcas, sea turtles, birds, dolphins, and manatees. Whether you choose to stay overnight in downtown, near the airport, at the seafront of Miami Beach and South Beach, we can offer you cheap deals for hotels, budget motels and vacation rentals.